When my coworkers heard that I was taking a wetlands class – they excitedly told me there was beaver activity just down the road from our office. I brought my tennis shoes and a raincoat the next day – eager to explore the nearby wetland. I was saddened by what I saw. The pictures above show what has happened to this wetland over time. Whether this little creek was created due to water diversion through the construction of SR 520 and I-405 or whether the roads were built around it – I am not sure. But I do know that if I were the ducks pictured above… I would not want this in my backyard. 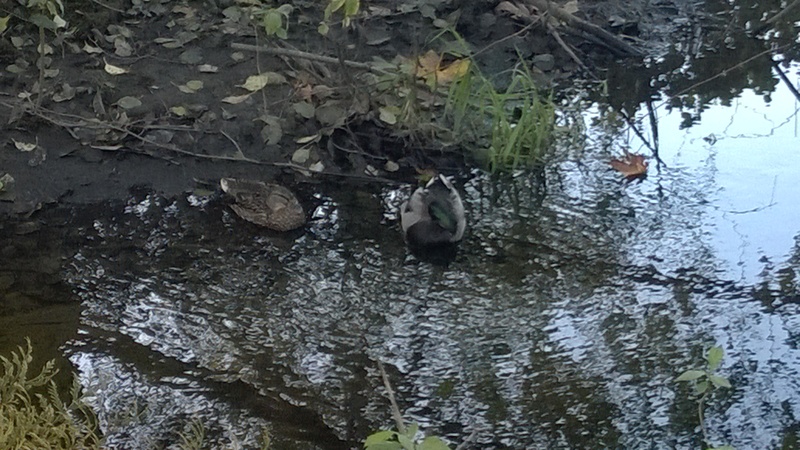 (Hey ducks – there have to be nicer places for you to hang out!) Note the small dam built by the beaver in the last photo that has a used drink container that has become part of the structure. I did not get to see the beaver at work – maybe he did seek a new home. 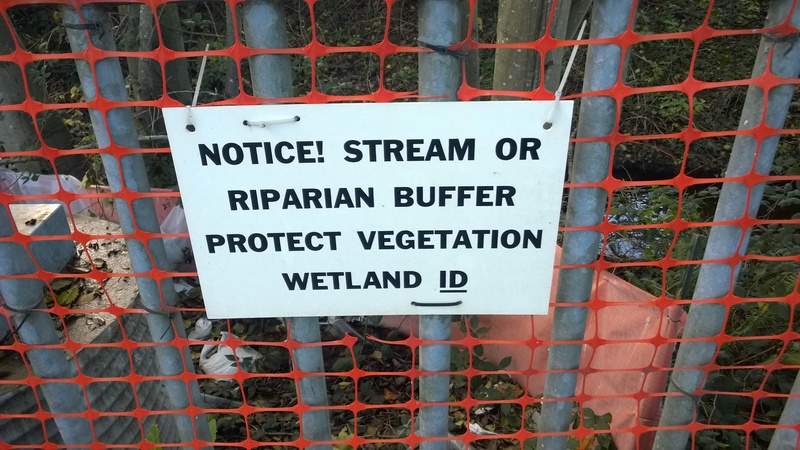 The signage and fencing suggest that authorities are trying to protect what is left of the creek and its inhabitants – but unfortunately – this is not enough. 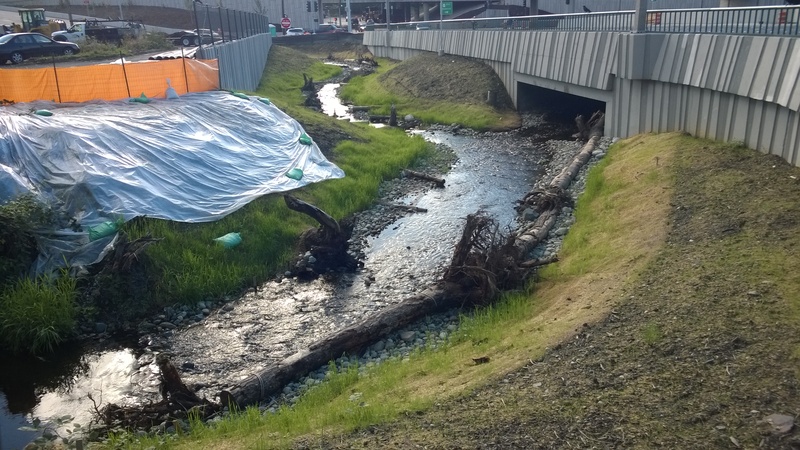 The highways nearby will produce waste that collects on their surface and will produce polluted storm-water runoff that will find its way into the creek. 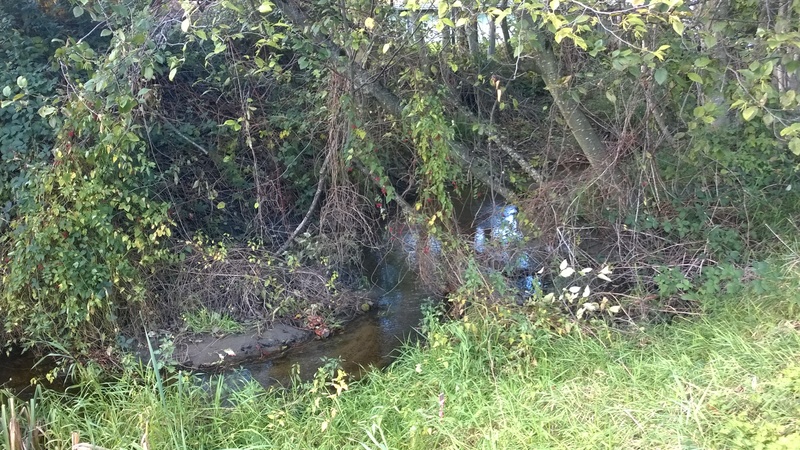 The color of the soil on the banks of this creek already indicate some pollution. The fact is – human animals are tough on their environment. We build roads, railways, dams, buildings, and sewers. We produce waste that will eventually find its way into our streams and watersheds – like Puget Sound and Lake Washington. Just like every vote counts, every action counts. So often when we think of watershed pollution – we think of big companies dumping toxic waste into oceans, rivers, and lakes. But individuals are also part of the problem. The most important thing this course has done for me is to open my eyes to the actions that can cause damage to our wetlands and watersheds and some simple things I can do to help protect them. This entry was posted in WOSK and tagged Wetlands on November 30, 2014 by katie64seattle. Don’t get bogged down – an interesting expression… especially now that I am learning more about wetlands and watersheds. I find it interesting that a natural phenomenon such as a bog has negative connotations. I am delighted to say that I came up with this title all on my own, and yet the text, Wetlands we are using in my class – has a similar comment that I found while researching for this post (Mitsch & Gosselink, 2007 p. 16). 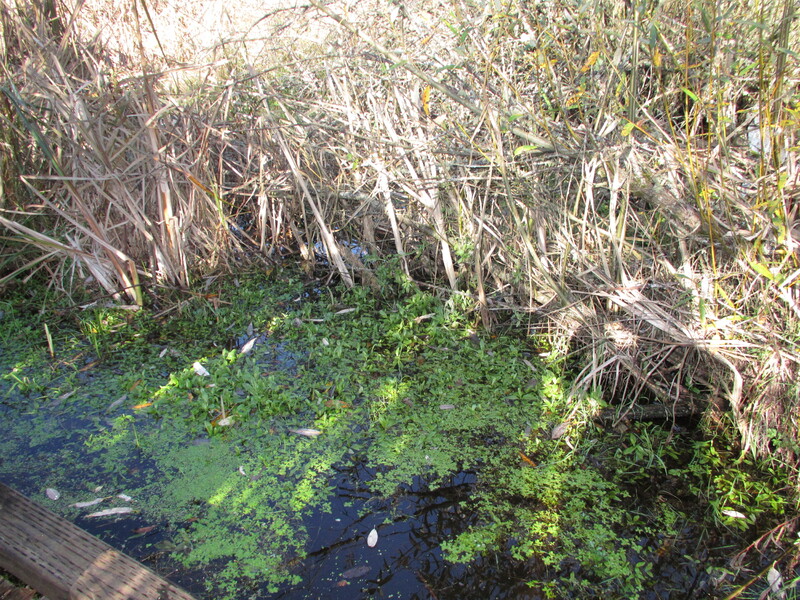 The authors remind us that wetlands have often been the subject of negativity through movies such as Swamp Thing or The Creature from the Black Lagoon. Fortunately – through the wonders of science – we are taking more note of the importance of wetlands. 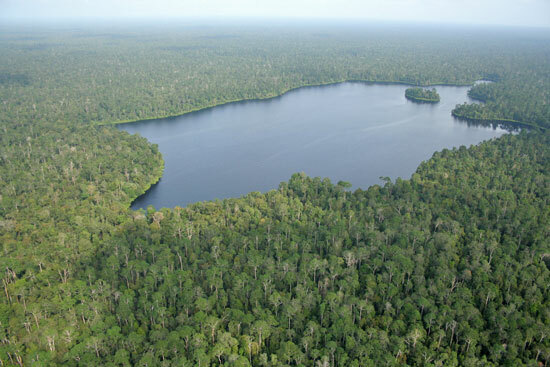 Original, drained and deforested tropical peatland in central Sumatra, Indonesia. 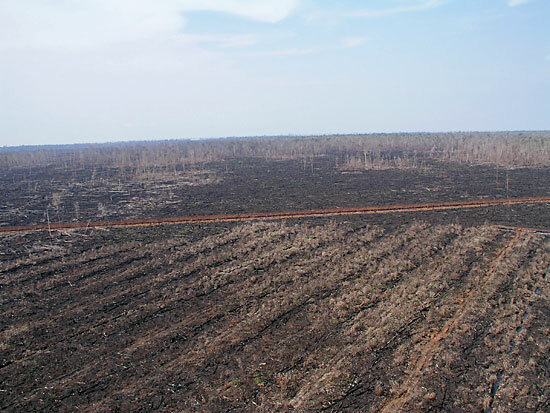 Peatlands have many functions including carbon storage, flood mitigation, animal habitat, and water filtration (Peatmoss.com) The Canadian Sphagnum Peat Moss Association / CSPMA says that peatlands are renewable. However, we learned in class that the carbon stored in peat, when disturbed, is released back into the atmosphere releasing greenhouse gases. Wetlands International echos this concern. One must keep in mind that scientists or ecologists views will often differ from organizations that make money doing what the ecologists feel is bad for the environment. Disagreements such as this are healthy for the environment. Let’s face it – humans will impact their environment. It takes some dissension to maintain a healthy balance between meeting the needs of humans and – preserving nature. 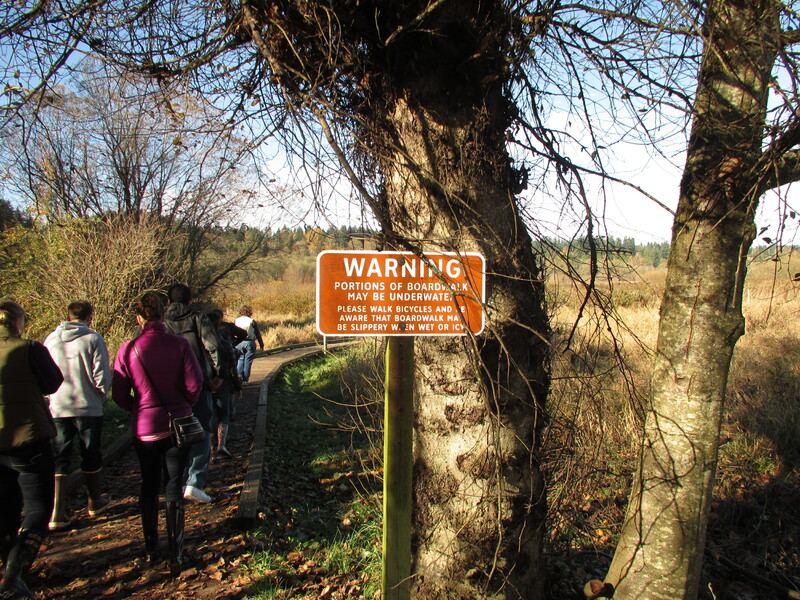 This entry was posted in WOSK and tagged Wetlands on November 25, 2014 by katie64seattle. 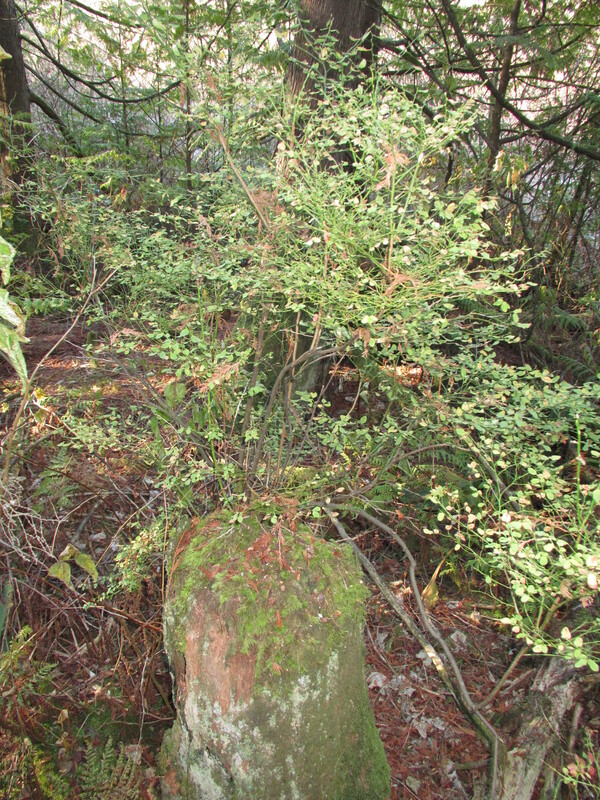 This huckleberry bush exemplifies why humans need to let nature take its course whenever possible. What appears to be a useless dead stump is actually a perfect breeding ground for this native plant. Last Saturday several classmates, my husband Donovan and I volunteered at the Northwest Stream Center in Everett WA as part of a community engagement experience in my Environmental Studies course at UW Bothell. It was a chilly Saturday morning. We had a sturdy breakfast of leftover egg foo young and coffee. We dressed warmly and were excited to greet the day. We met Marian Hansen, our host who struggled to get the lock off of the building due to the light frost of the morning. Marian is a volunteer at the site responsible for the vegetation aspect of the project. This chapter of Adopt a Stream is building a walkway through this wetland to allow people to commune with and respect nature. The project is a partnership with Snohomish County Parks. Adopt a Stream has many exciting projects you can read about here: http://www.streamkeeper.org/aasf/Welcome.html but for this post I will focus on our experience with Marian. I love the curvy way a cedar grows. Next time you are in a forest – take a close look at how this tree bends and seeks the sun. 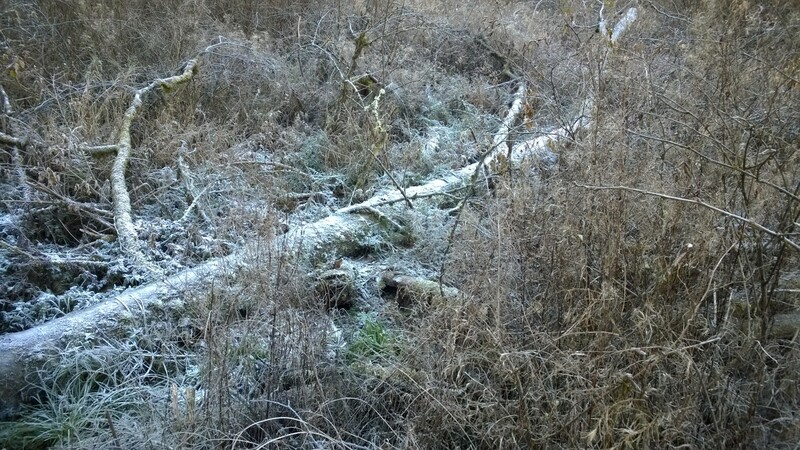 I failed to capture the magic of this fallen tree. It was a cross between a big, scary alien and intricate lace. Marian’s design – like something out of Tolkien. 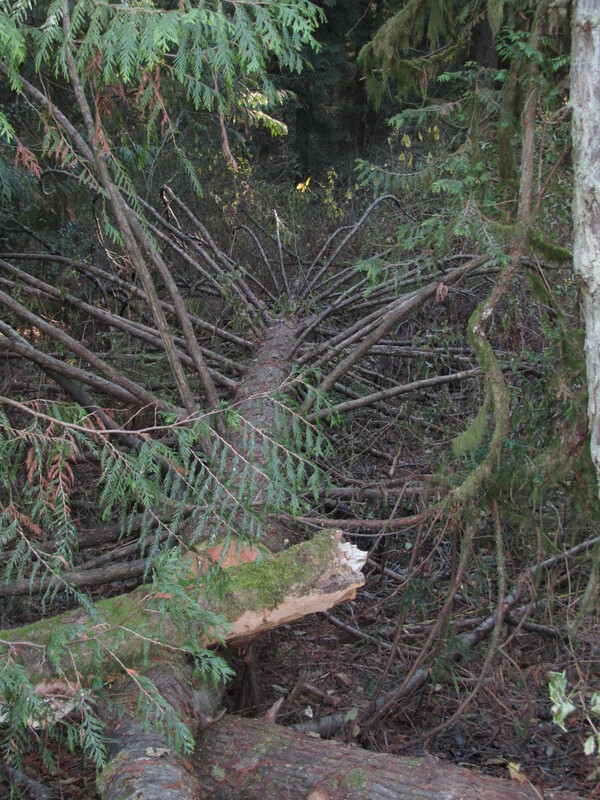 Fallen trees have a place in nature – the project tries to leave trees where they fall whenever possible. 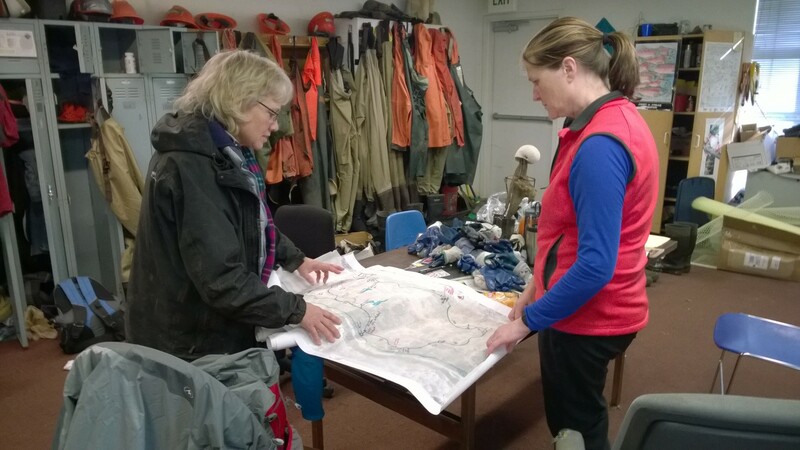 Marian is a UW Bothell Alum who volunteers 20 to 40 hours a week at the NW Stream Center. Her passion for this project is evidenced by the way she looks at each and every twig in the wetland. Marian has names for tree stumps and other areas the same way we have names for pets. Even though she had four willing and able volunteers, she first spent a great deal of time getting to know us and asking about our educational goals. Before she put us to work – she gave us a tour of the project pointing out various aspects of the project explaining that fallen trees and brush piles provide important habitat for small animals; and how a small water area near a dead tree might provide a good habitat for frogs. Frog habitat within a dead majestic stump. Almost apologetically – she finally put us to work. 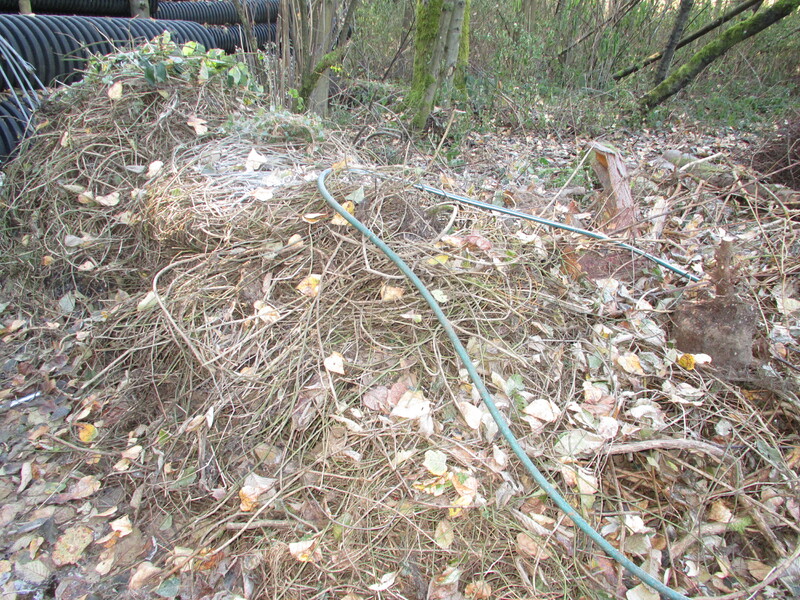 We helped move a large brush and wood pile that had inadvertently been plopped upon some small plantings including a baby cedar and some ferns. It was indeed an honor to be permitted to wander around in her forest. For every single plant is dear. What may look like a pile of earth or soil might actually be some native plants she has staged for a future planting. The highlight of the day was when we got to the bottom of the pile and found one of her babies (a small cedar sapling) that was alive and well. A team from the U.S. Navy helped Marian remove invasive Himalayan blackberry bushes – what a job! I dare anyone to spend a few hours with Marian and not come out of the experience wanting to help her in any way to create a space where humans and nature can convene. Marian explained how the project is interdisciplinary and how the engineer, the ecologist, and the landscape architects all have different points of view that in the end, provide meaningful insight into the project. I am looking forward to a time in my life when I have the availability to volunteer and really get involved in conservation projects such as this. My time at the Northwest Stream Center was way too short and – I will be back. This entry was posted in WOSK and tagged Wetlands on November 20, 2014 by katie64seattle. It is a tremendous challenge keeping a balance between humans and nature. After all – humans are a vital part of nature. 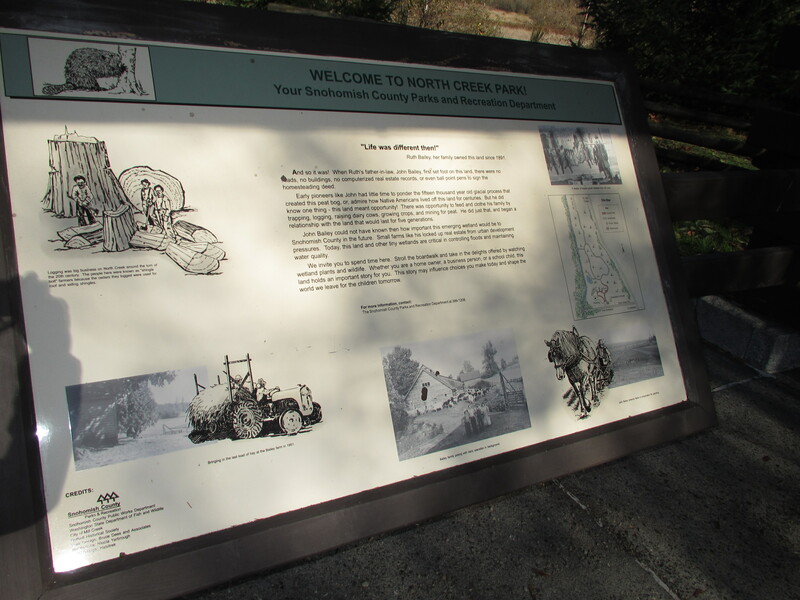 Last Saturday our class took a lovely walk on a boardwalk that is part of North Creek Park. I have to say it was very interesting as parts of the boardwalk had several inches of standing water from overflow of the wetland. 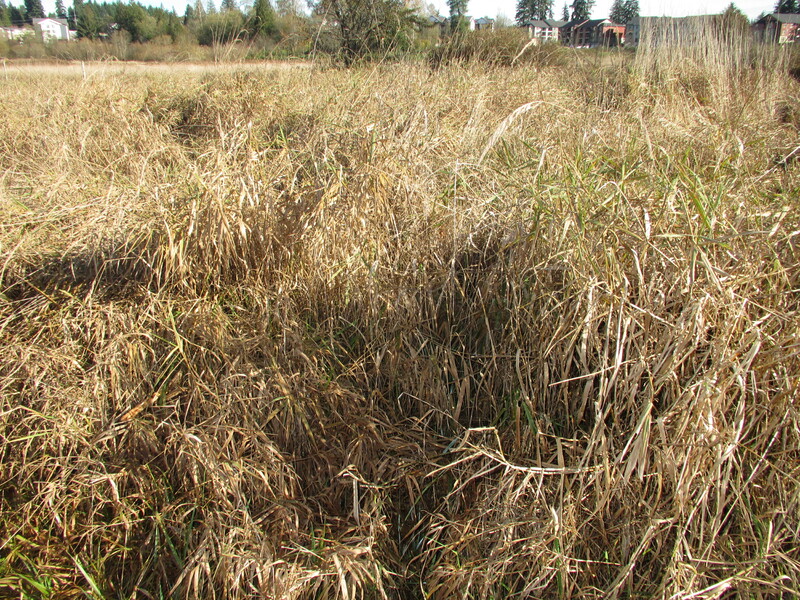 …and that other was invasive such as the reed canarygrass that was originally seen as a beneficial vegetation that stabilized banks – but is now known to be invasive – and perhaps destructive in a wetland. 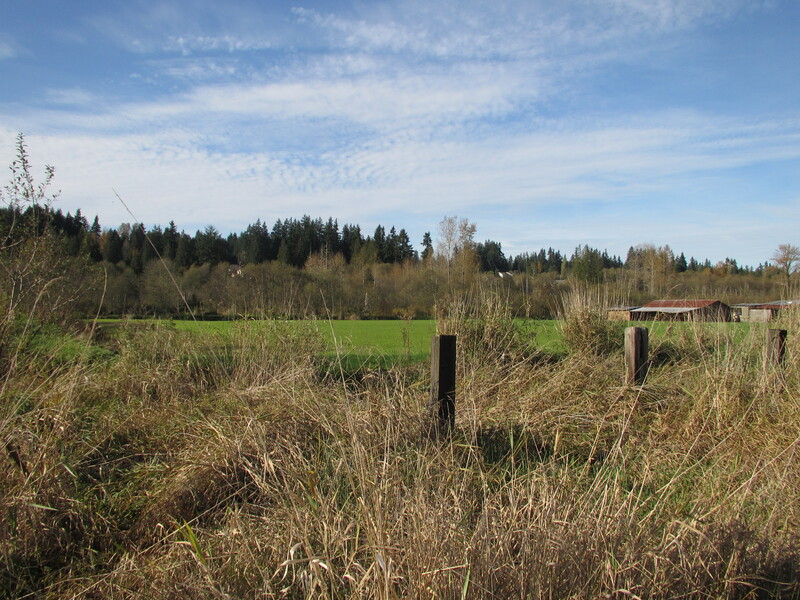 The most notable part of this wetland is that it is flanked by apartments and condos which could threaten its longevity through pollution or other human impacts. The original farm is for sale – in case anyone out there with a few hundred thousand dollars wants to buy it and maybe give it back to nature. 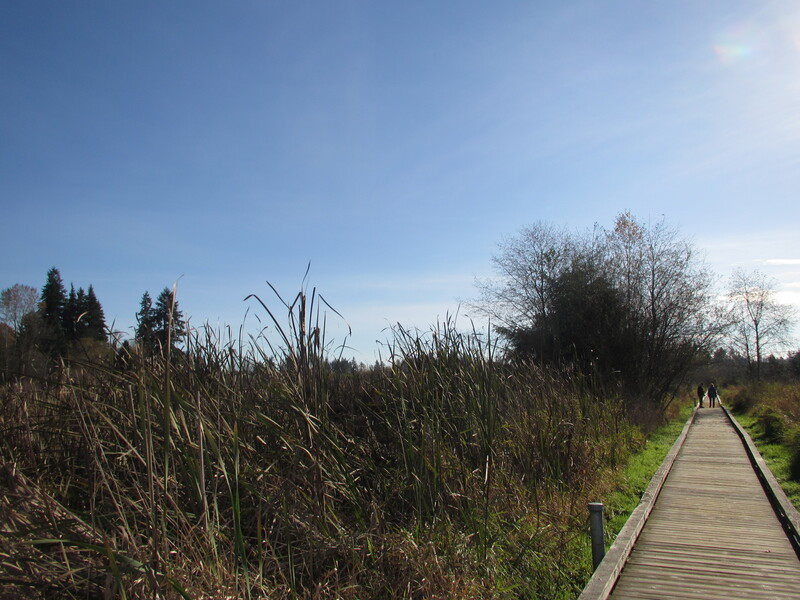 Take a walk through this beautiful wetland. Pack it in – pack it out. Hear, smell, and see nature. From the tiny vegetation growing on the water surface – to the dragonflies. If you are really lucky – maybe you will see a beaver! Closing thoughts… it is important to create human habitats such as nature boardwalks where we can see, smell, hear and learn about wetlands. But – at what cost? Human appreciation contributes to preserving natural areas such as this but, in so doing, aren’t also trespassing on nature? This entry was posted in WOSK and tagged Wetlands on November 14, 2014 by katie64seattle. So – nitrogen is not bad – but too much is not good. Too much can cause excessive algae growth which can kill aquatic life such as salmon. However this is an aside. My subject is evapotranspiration. This is a long – scientific – scary word. However, in nice non-scientist terms – it simply means – plant sweat. So what does this have to do with my wetlands class? Wetland plants absorb water and then release it through their stomata – lets call them – leaf pores (just like we humans sweat through our pores). This provides two essential functions. First – the transpiration releases moisture into the atmosphere providing climate regulation and cooling. 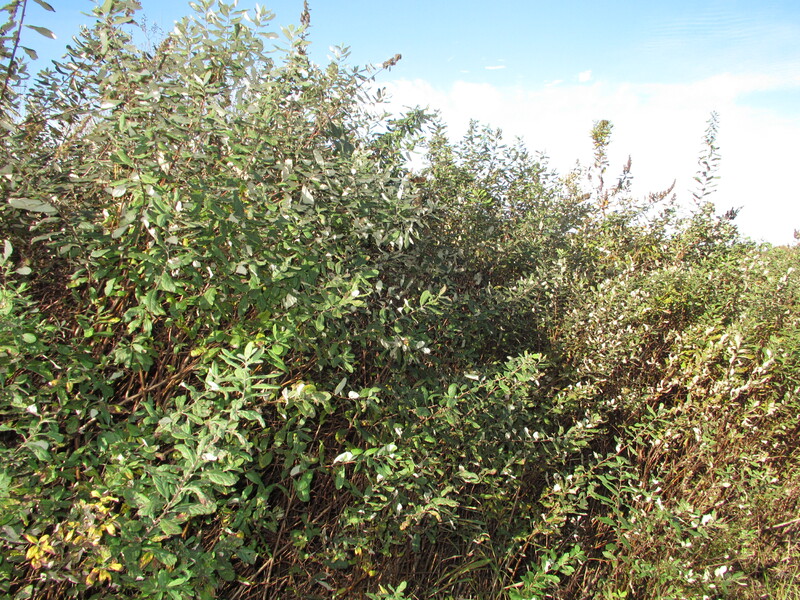 Second, as these plants use the water in the wetland, there is more space for additional water to be stored. As I understand it – this can provide benefits such as flood mitigation. There you have it. Plant sweat is an essential part of the hydrolic cycle. I wonder if human “evapotranspiration” also helps the environment? That may give us all more incentive to go for a run around Green Lake on a sunny day! All you scientists out there – feel free to help me out and further explain evapotranspiration. I had a lot of help from my class and also from the websites below. This entry was posted in WOSK and tagged Wetlands on November 8, 2014 by katie64seattle. OK so I am super excited… My husband and I are hoping to volunteer in the building of a nature trail at McCollum Park. See more in the article by the Everett Herald. 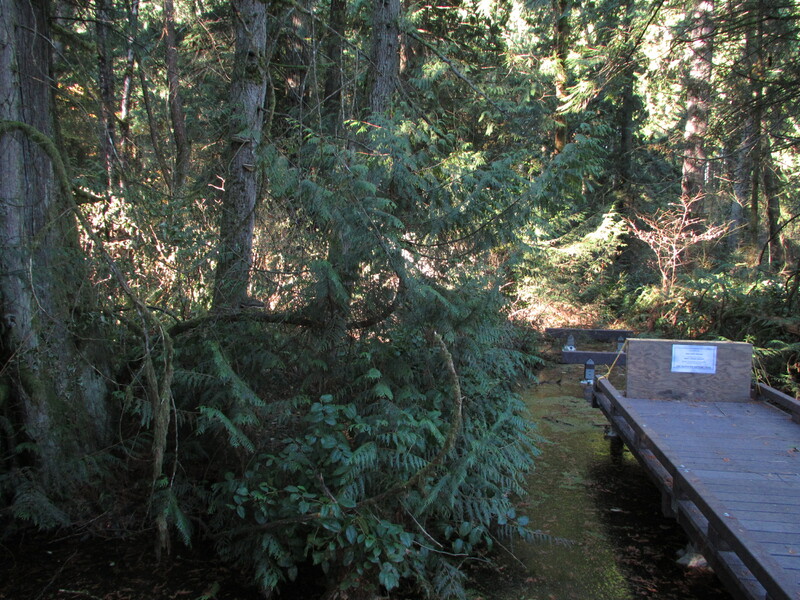 Adopt a Stream Foundation has volunteer opportunities to help build a boardwalk through the wetlands of McCollum Park in Everett, Wa. You too – yes you! can help and become a part of history. In our own backyard…Tom Murdoch heads a local chapter. UW Alum Marian Hanson is also involved in the project and she is so generous with her time that she is willing to be available for students such as myself to see what is going on with this project. Note: I am not certain who was the first organization to create Adopt A Stream. The EPA lists Delta Laboratories but I have been unable to find out if they are indeed the parent organization for the United States. These types of opportunities are what make school cool! 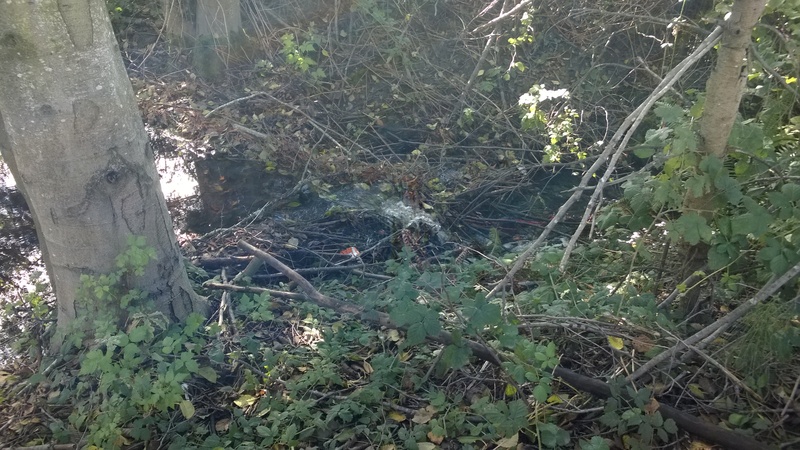 Photos to follow – once we are fully engaged with the muck! 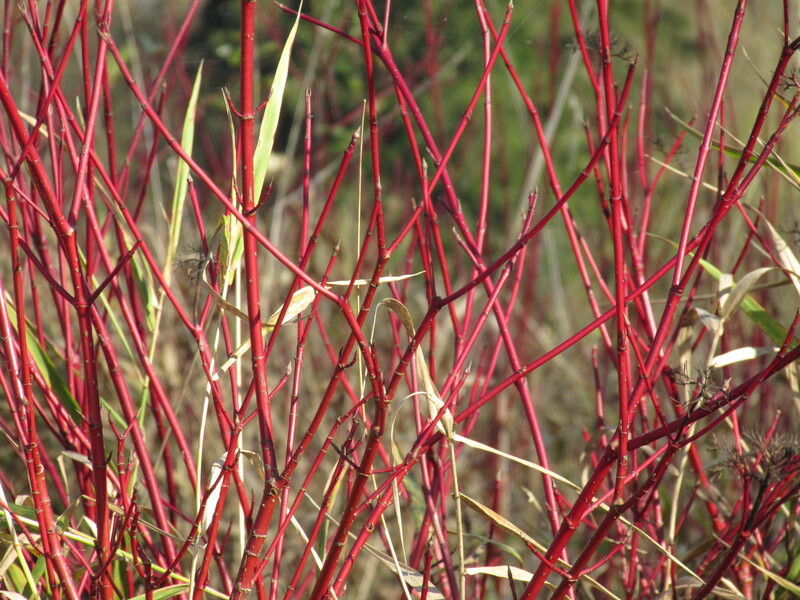 This entry was posted in WOSK and tagged Wetlands on October 23, 2014 by katie64seattle. Buy organic? What’s in it for me? This week I learned about hydric soils both organic and mineral. What stood out is the term “organic” which is bandied about in food markets. Organic foods are marketed to be pesticide free, richer in nutrition, and generally healthier. Here is what really matters…in my humble opinion. Organically grown foods – if they are truly organic, that is grown with natural compost instead of fabricated fertilizer are said to reduce the carbon footprint or – reduce greenhouse gas which is a cause of global warming. So organic foods are not just more nutritious, they are also good for the environment. You can read more about this topic in many places on the web including this post by TREEHUGGER. To relate this to my Wetlands and Our Watersheds course… fertilizer can end up in our aquatic ecosystems and actually kill fish by robbing them of oxygen. The Natural Resources Defense Council (NRDC) explains this in simple terms. 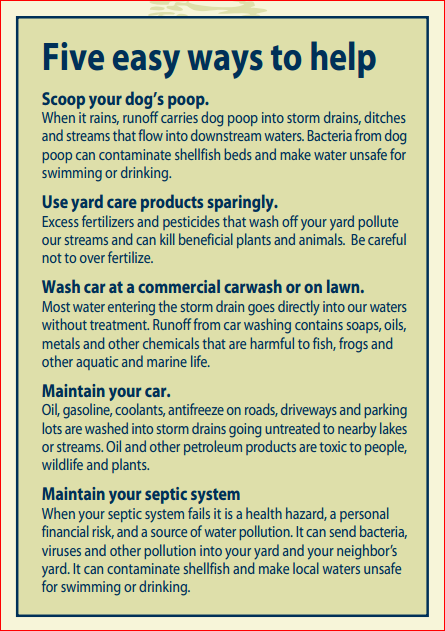 Fertilizer that makes its way to our watersheds can increase algae growth. When the algae decomposes, it uses oxygen and reduces oxygen available for fish and other aquatic life. So, buying organic foods is not just about your health – it can also improve the health of our watersheds like Puget Sound or Lake Washington. The problem is cost… I am in a “dink” situation. This means dual income, no kids. Well, I have kids but they are grown. It is not difficult to make environmentally conscious choices when you are feeding just two adults in a two income home. People that have a house full of children and maybe a stay home parent – cannot necessarily afford to be environmentally conscious. 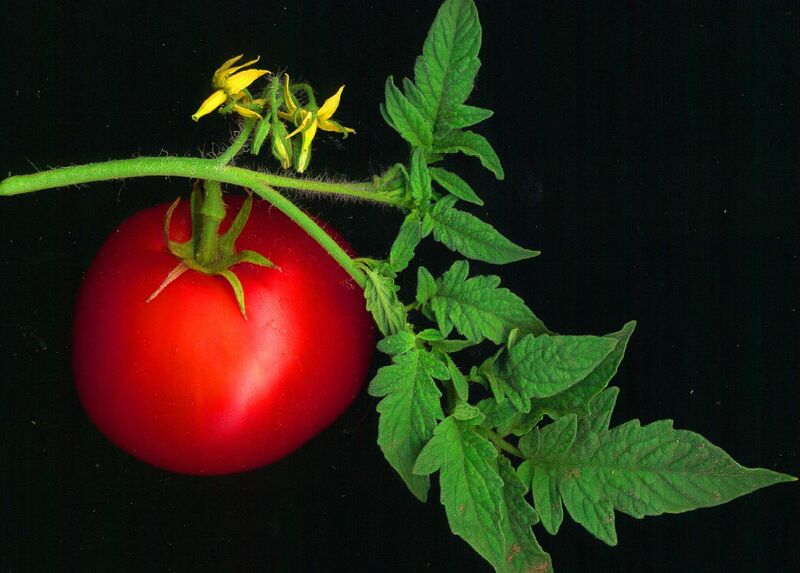 Even as a dink – I find it difficult to go to a farmers market and pay $5 for a single lovely tomato. There are also those living on Social Security that do not have the luxury of being environmentally conscious. My question is why is it so much more expensive? I love a good steak, but after seeing a classmate’s presentation on how beef is produced… I have decided less is more and I will choose (whenever possible) to buy grass fed beef rather than the much less expensive cuts that dominate the grocery stores. I could launch into federal subsidies for non-organic foods. A quick search told me this is a research paper and not a quick post on my blog. I do know that high fructose corn syrup is found in way too many foods… I try to avoid it. I feel that organic food should be the norm – it is becoming more affordable but we need it to become mainstream. Organic should not be a luxury label for the dinks of the world; but rather the most common food available for both nutritional reasons and environmental initiatives. The energy needed for organic farming is about 30 percent less than the energy needed for high-input conventional farming. Organic farming produces 48 to 60 percent less carbon dioxide than conventional agriculture. Organically farmed soil holds more carbon. It is about twice as efficient in temperate climates at sequestering carbon, keeping it from contributing to global warming as carbon dioxide. Organic farming produces less nitrous oxide (another greenhouse gas) due to less nitrogen fertilizer use, less mobile nitrogen concentrations, and good soil structure. Organically farmed soil holds more water. It requires less irrigation, which conserves water and energy.